Just how shady can this Pearson story get? Very, apparently. 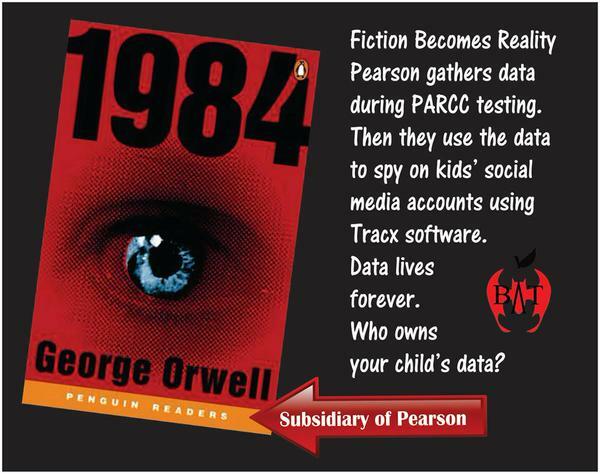 Pearson monitors students’ and others’ social media for mention of Pearson, its tests, etc. It then finds a student has Tweeted about a PARCC test they had just completed. The Tweet didn’t have a photo of the test. The student had not signed a non-disclosure agreement (NDA). Pearson work out what school the student goes to. In a twist of irony, ‘1984’ is published by a subsidiary of Pearson. Pearson alert the education department about the ‘priority 1 item breach’, asking it to be dealt with. The education department contact the testing coordinator at the student’s school. The information passed on says the Tweet was done during the test and had a photo attached: It did not. The student was contacted and deleted the Tweet. The student’s parent was talked to. The parent was very concerned to find their child’s social media had been monitored this way. Bob Braun wrote a piece about the affair. Bob’s blog suffers a Denial of Service (DoS) attack by unknown hacktivist/s. People discuss Pearson’s use of Tracx to “monitor and listen” to what people are saying about them on social media. Tracx gets their Pearson page taken down. Pearson put out a press release saying they behaved perfectly responsibly…. Pearson Snooping on school students’ social media? « Pearson snooping on school students’ social media?